Two months have passed since the last news release at the Norwegian Vinmonopolet, and it’s time for a new one. The last couple of years many of the importers have marked November as THE month for new releases, something that very much has to do with the Oslo Whiskyfestival – the main Norwegian whisky festival. A whooping 30 malts (whereof one is Japanese), one Irish whiskey, one Scottish blend and three bourbons gives a total of 35 new whisk(e)ys for the Norwegian market in one go. Six of the malts are available through the normal assortement (available in all the larger stores, can be ordered to the smaller ones at no extra cost), the rest of the malts and the other bottlings might pop up in some stores but normally they have to be ordered in (still at no extra cost). Due to the amont I’ll split the news into a couple of post, this first one will cover the six malts released into the larger stores. As usual I’ll also be giving the price in pound sterling (£). Last time the exchange rate was £1=9,84NOK, this has changed due to recent event on the world markets, and the rate as i write this is £1=11,62NOK. Ireland isn’t crowded with distilleries today as it once was. A total of four active distilleries exists on the Emerald Isle as of today: Old Bushmills (Co. Antrim/Northern-Ireland), New Midleton (Co. Cork), Cooley (Co. Louth) and recently re-started Kilbeggan (Co. Westmeath). But today it was made known that a planning permission has been applied for to build a distillery in Dingle, Co Kerry. The €8m development is to use a former creamery building, just outside the town centre, to build the distillery and a visitors centre. The money behind the plans is coming from Jerry O’Sullivan, a Dingle auctioneer and managing director of Southbound Properties, which sold the creamery to the distillery-project and the Porterhouse group – a small pubco who also has it’s own brewery and hotel. The pubs are in London, Dublin and Bray (hotel/pub). Former distillery manager John McDougal (ex-Laphroaig, Springbank, Ladyburn, Balvenie and Tormore, and involved in the running, development and start up of several other distilleries) is hired as a consultant. Forsyth’s in Scotland will be hired to build the stills. The whiskey will be triple distilled (pure pot still) in the traditional Irish manner, and will be matured in ex-bourbon and ex-port(!) casks. While we wait for the first dram to make it’s way into a whiskey glass the distillery will also be making gin. It’s belived that the distillery will be up and running by the end of 2009, if all goes as planned (something that rarely happens), and four years later the first whiskey is to be bottled. I raise my glass to you lads. Here’s to the possibility to sample a Dingle-whiskey before Christmas 2013. The Good Pub Guide 2009 hit the street a forthnight ago and comes complete with a range of “Pub of the Year”-awards. In the category Whisky Pub of the Year this years winner is the Port Charlotte Hotel, in Port Charlotte on Islay (website). I tip my hat to you. Sweden, like Norway, has a state run monopoly on sales of alcoholic beverages. A couple of years ago they eased the rules a bit and let the monopoly, Systembolaget, arrange an auction where private individuals could sell rare items. All items had to go through a pre-screening where non-rare items got excluded from going on sale. After several such auctions where wines and spirits have been sold, the time has now come to a pure whisky auction – with 253 lots up for grabs. On Tuesday 7th October at 3pm (CET) the auction starts in Stockholm, Sweden. Bidding can be done onlineor by phone if not able to attend – more info on how to bid, pay and take possession on won items go to Stockholms Auktionsverk’s webpage. Click here for to view the items going on sale. Some steep estimates, but if the previous general alcoholic drink auctions are anything to go by, great deals can be made. I’ve been away for a bit (work-related lock-in seminar), and have spent the last few days just trying to get through the amount of correspondance received in that time. An inventor claims to have produced a device that aged alcoholic beverages in just 30 minutes. For a mere £411.25 (4350 NOK) any young malt can be made into a aged beauty. The device, called “The Quantum Ultrasonic Wine and Spirit Ager”, supposedly changes the chemical balance of the alcohol esters, thereby speed aging them. According to the inventor, Casey Jones, it can make paintstripper whisky taste like an 8 year old Single Malt, and make a bottle of £3.99 plonk taste like a vintage wine from the best houses. Can’t say I’m convinced as if it only “ages” the products, a cheap plonk would turn into a vinegary plonk – as it’s not made for ageing. If anybody out there want’s to give it a try, please drop me a line about the results. The device can be purchased here. 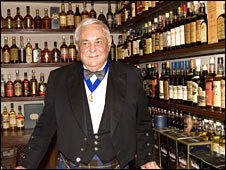 You are currently browsing the WhiskyViking's Corner blog archives for October, 2008.